Forsyth Technical Community College (Forsyth Tech) is the fifth largest community college in North Carolina and serves the people of Forsyth and Stokes counties with more than 10 convenient locations. 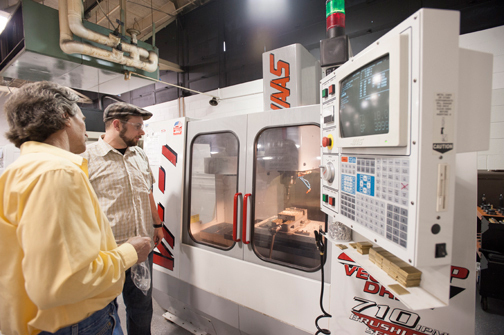 To learn more about Forsyth Tech’s Advanced Manufacturing programs visit here. In addition to their many credit programs, the college offers a wide variety of more vocationally focused non-credit courses through its Economic and Workforce Development division, which serves approximately 25,000 students each year. These programs include introductory courses in areas such as welding and electrical contracting, which may teach skills useful in aviation manufacturing and maintenance. For local businesses, the college offers corporate training in such areas as leadership, efficiency and conflict resolution, and works closely with many companies to provide customized workforce training designed to fit specific needs. Check out the Advanced Manufacturing programs that can prepare students for various positions in the aviation industry. Learn how you can pursue your career goals easily at Forsyth Tech!